There’s nothing like the smell of clothes coming off the clothes line. Thanks for the note to click to enlarge —- love the detail here. Very cool photo! Yes, “bigger is better” in a way — but either way it’s a great shot of someone not afraid to “air their laundry in public”! Also such great detail, all those little shirts! “Liking” from the Barbados airport – left behind me line-hanging laundry on Bequia for a few weeks. At least mine isn’t quite so tidily presented. A woman after my own heart Carin. 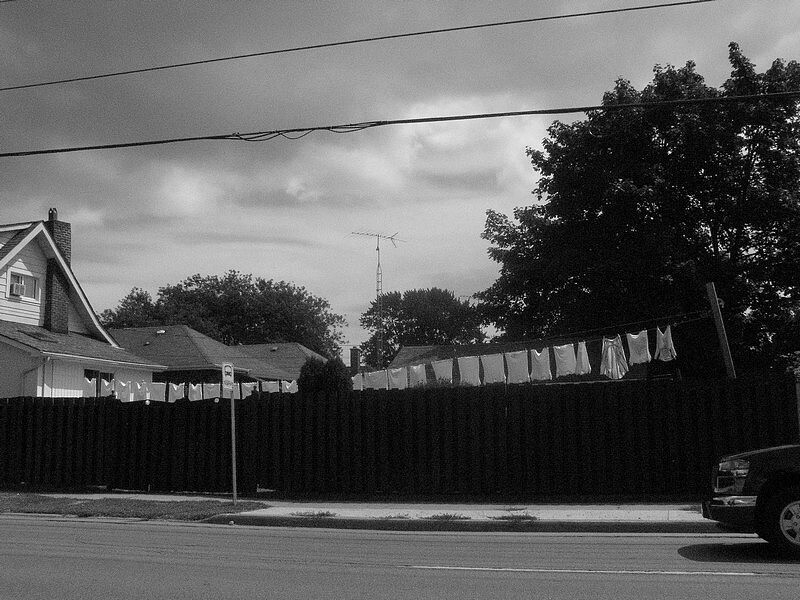 I love everything to do with clothes on the clothesline. A great choice to do it in b&w. Thanks, Allison. It’s a rarer and rarer sight. Still makes my heart flutter though… sheets blowin’ in the wind. Tee-shirts too. Lots of memories rushing in thanks to this shot, Carin. I agree with Allison … B&W was the way to go to make this a ‘story’ and not just a photo! You guys. I love your eyes. I love the varied lines, shapes and overall abstract effect, in glorious contrast to the frilly bits and the possibility of stories and the sensory – especially olfactory – effect of thinking about laundry on a line.